Life Fitness New R3 Lifecycle Exercise Bike combines the ultimate in comfort with exceptional attention to detail. With thoughtful additions like a reclining seat with a breathable mesh fabric back, the New R3 is sure to deliver a comfortable ride. This exercise bike provides the smooth, quiet ride and durability you'd expect from the #1 brand in health club worldwide. Pair the New R3 with the Track Console for tracking and entertainment features to keep you motivated and enhanced customization to better help you reach your fitness goals. IPod compatible on Track Console only (iPhone 4, iPhone 3GS, iPhone 3G, iPhone; iPod Touch 4th, 3rd, 2nd, 1st generation; iPod Classic, iPod with video; iPod Nano 6th, 5th, 4th, 3rd generation). Life Fitness Virtual Trainer accessible on Track Console only. Create custom workouts and track results at www.virtualtrainer.lifefitness.com; connect to console via USB or Life Fitness Virtual Trainer app. Life Fitness Virtual Trainer Accessibility– Track Console only: Create custom workouts and track results at www.virtualtrainer.lifefitness.com; connect to console via USB or app. Warranty- Lifetime warranty on frame, 3-year on parts, 1-year on labor (warranties outside the U.S. may vary). ToughTrain 3.0 out of 5 Have average features and available in a very descent price. This machine is well suited for begginers. *Note: Most of the sites, stores or shopping portals listed above sell Life Fitness New R3 Lifecycle Exercise Bike with discounts and other exciting offers. 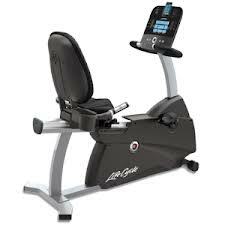 There is a possibility that the some of above websites are not selling Life Fitness New R3 Lifecycle Exercise Bike now. Toughtrain.com is not liable for such cases or instances. Also we do not recommend any seller for Life Fitness New R3 Lifecycle Exercise Bike and a buyer should buy from where he/she gets best deal with quality of products, service and on time delivery (shipment).